Montreal, Canada (November 27, 2017) AlazarTech, a manufacturer of high-performance, low-cost PC Based Instruments, today announced the release of ATS9371®, a 1 GS/s, 12 bit waveform digitizer based on the 8-lane Gen3 PCI Express bus. ATS9371 features two simultaneous analog inputs that can each be sampled at rates up to 1 GS/s with 12 bit vertical resolution. Each input has its own 12-bit, 1 GSPS ADC chip. Each channel has 2 Gigasamples of on-board, dual-port acquisition memory. Full scale input range of the ATS9371 is fixed at +/- 400 mV. The 8-lane Gen3 PCI Express bus interface on the ATS9371 is capable of sustained data transfers as fast as 6.8 GB/s. “Many customers were asking for a more affordable waveform digitizer. They were willing to compromise on the sample rate compared to our 4 GS/s ATS9373, but not the PCIe Gen3 throughput. ATS9371 targets exactly this set of customers.”, stated Muneeb Khalid, President of AlazarTech. “An added advantage of ATS9371 is that its export from Canada is not controlled, and it is much easier to deploy in OEM products than higher speed digitizers that are export-controlled”. The unit occupies only one half-length PCI Express x8 or x16 slot, making it very easy to integrate it into a customer’s system. OEMs can integrate the ATS9371 PCI Express digitizers into their own systems very easily using the Windows and Linux compatible ATS-SDK Software Development Kit. This SDK includes sample programs written in C/C++, Python, MATLAB®, and LabVIEW®. 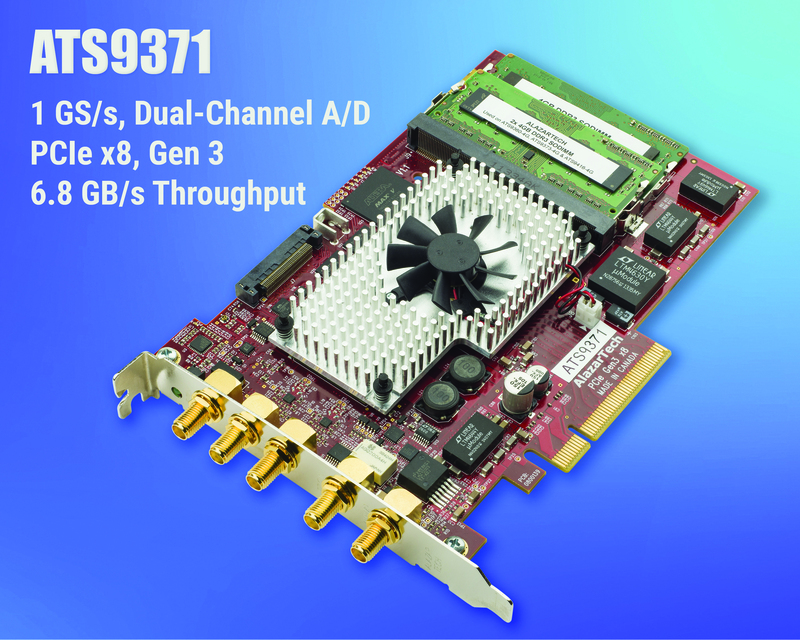 ATS9371 PCI Express digitizers are also compatible with ATS-GPU, a software library developed by AlazarTech that allows users to do real-time data transfer from ATS9371 to a GPU card at rates up to 4 GB/s. ATS9371 is available immediately from stock. U.S. prices start at $10,000 in single quantity. Volume discounts are available. International prices may be higher.